The cloistered course is known for its fair playability, undulating greens and plush fairways. Usually measuring out to nearly 6,800 yards, course construction has altered the back-nine and turned No. 14 into a 151-yard par-3, roughly half its usual distance. This match will be Austin Peay’s first action in heads-up play since taking on Belmont to start the 2017 spring slate in Gulf Shores, Alabama. Among this week’s lineup, only senior Taylor Goodley and junior Meghann Stamps have any Division I experience in the team-on-team format. Goodley will slot in as the No. 2 this week, behind freshman Taylor Dedmen. 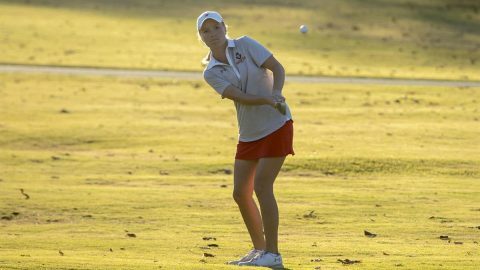 Senior Reagan Greene, who won her last tournament of the fall at the Town and Country Invitational, will play as the No. 3 with Stamps and another freshman, Shelby Darnell, closing out the lineup. Sophomores Andrea Presilla and Riley Cooper also will compete as individuals. There will be no live scoring provided for this event; complete results will be provided at the conclusion of play on Saturday.